The late, great John Peel once categorised the relationship between himself and his long-time producer John Walters as being like that between “a man and his dog, with each believing the other to be the dog.” I am reminded of this every time I go to Nyewood Lane, as while it doesn’t apply exactly to our links with the Rocks, there is a kind of implied superiority from either side. Bognor believe that they ‘play all the football’, one man apparently remarking in the tea-bar queue that he was getting “a crick in his neck” watching us. On the other side of it, we believe ourselves to be the bigger club. 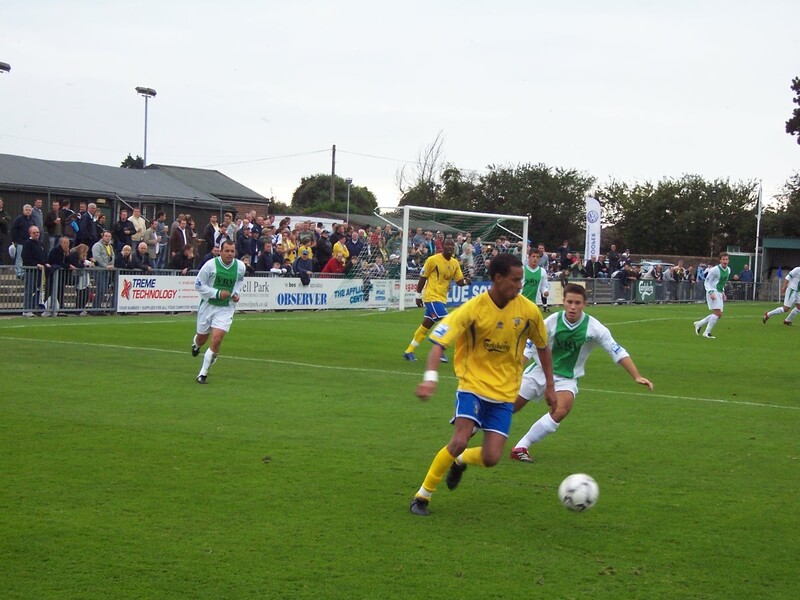 In fact when, two seasons ago, their red-hot goalscoring machine Ben Watson decided not to join us from them, he was decried by many as “lacking ambition.” If Bognor Regis Town had a collective head, we’d probably want to pinch its cheek and ruffle its hair. Needless to say the Rocks fans loved the fact that Watson turned us down. If he weren’t a terrace hero already, that would have been enough to seal it. However, like I’ve mentioned previously, our rivalry with Bognor is somewhat lacking in lustre, a bit like a white high-top van covered in so much dust as to make any keen fingertip graffitist that happens to pass by instantly hyperventilate. There’s not even been that much inter-club movement of players over the years, although the exceptions to that are both stationed at left back today. 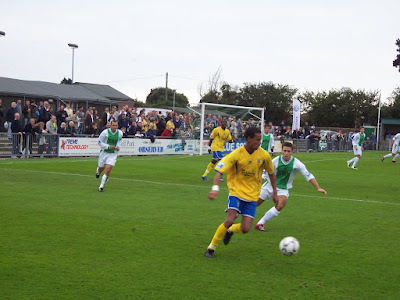 Our Brett Poate spent some time on loan at Bognor a few seasons ago during a period of patchy form, while BRT’s Sebastian Wallis-Tayler (I do enjoy a surname that sounds not only quite posh but at the same time a little bit like the leader of the peasant’s revolt) once or twice played for us. To give an indication of how things roll between us, as a group of we Hawks walk through the turnstiles into the ground, we are greeted by Rocky the Bear, the Bognor mascot, and he’s instantly in for the hugs, although sadly only with one of the ladies amongst our number. Boo hiss. Skiffy want love too. There’s no cheeky goading coming from the bear, only some thrown shapes reminiscent of a Mockney uncle dancing with the kids table at a low-key wedding reception. 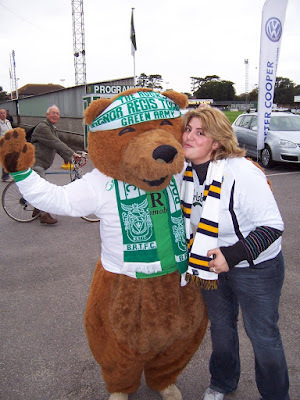 One of our supporters starts chanting about Hawk hero Rocky Baptiste at his namesake mascot, implying the superiority of our 69 goals in 101 games star striker over a giant teddy bear with restricted movement. You’d hope that was a given, but Rocky the bear isn’t keen on the case of ‘mistaken’ identity, waving his arms in a manner that suggests he’s just been tapped on the shoulder and aggressively asked his whereabouts in a recent pint-spilling incident. By comparison to Bognor, we’ve been quite lucky to have people with deep pockets involved in our club who have enabled us to punch about our weight financially. Bognor have not had that luxury. They’ve had Jack Pearce, who’s been a fixture in both boardroom and dressing room since the reign of Edward the Confessor. Last season, after all the years bringing Bognor, to be fair, a number of reasonable successes, particularly in the FA Cup, and built up a fairly neat ground with a handsome social club, he finally had enough of the pressures that come from worrying about every wobbly nook and rusty cranny of the place, and took the last couple of months off. 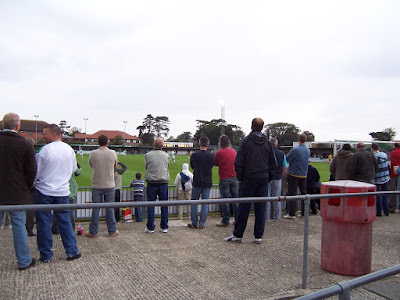 The next weekend, while Bognor were at home, Jack was knocking about West Leigh Park (so regular a haunt of his over the years, he may well have an H&’Dub mini-kit suckered to the rear window of his Metro) watching us and was asked why he wasn’t at Bognor. “I’ve had enough of them, and they’ve had enough of me” harrumphed un-jolly Jack. However, having retreated and regrouped, Jack’s back this season and, frankly, it wouldn’t be the same without him squawking from the touchline. However, despite the motivational screeching, they’re not having the best of seasons. 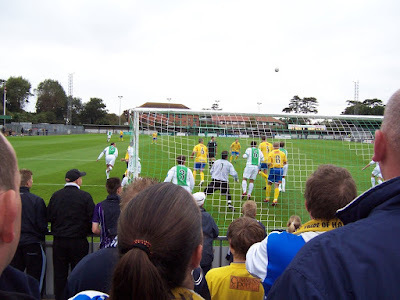 Currently in the relegation zone, when they drew us out of the hat, their initial feeling was one of deflation, a foreboding sense of certain defeat and, thus, no bunse in the Bognor bin. However, the H&W season has taken a turn for the mediocre in the past fortnight, with a 3-3 draw at Maidenhead followed by defeats away at Weston-Super-Mare and at home to Lewes. Not promotion form, let alone championship form, and we were the popular choice amongst our Conference South peers to walk it this season. As such Bognor probably had less to worry about than they first thought. One bright spot of the last few weeks has been the signing of Brighton legend Charlie Oatway, who has been forced to quit the pro game. In the past we’ve seen many sides of the coin with employing retired ex-pro’s, and we always keep our fingers crossed that they turned out be as brilliant as Liam Daish was for us round the turn of the century. On the basis of Charlie’s first game against Lewes, he may well turn out to live up to that expectation, tracking around the pitch with considerable energy, breaking up many an opposition attack, and starting many of ours. "He's got 12 names, my friend, I thought they'd never end..."
You can see from this why I never offer up any new material when stood behind the goal. Mind you I’m not the only one pitching the penny dreadfuls. Another recent suggestion for addition to our repertoire was this effort. The tune should be obvious. In my defence, the guy who suggested the latter makes his living as a police officer. So he should know better. In the end we opt for the safe as houses “there’s only one Charlie Oatway”, necessity not being the mother of invention on this occasion. Today, rather sadly, Charles was a little more absent from the meat and tats of the midfield doin’s. Just as well then, that Andy Gurney should turn in a tremendous performance. However before we got to the pinnacle of that performance, we had to suffer going behind on 53 minutes through Chris Greatwich. It’s not a forte of ours to turn around a deficit and thus, I confess, heads did start to droop behind the goal, particularly as Bognor are defending well. Rocks skipper Mickey Birmingham responds to jokes about his age from our lot at a corner saying “I f**kin’ am [old], and I’m f**kin’ feeling it too” before sprinting up the touchline like a teenage cougar to start an attack. Lying git. It is perhaps the old boys day out as just after this comes a Gurney goal. Rocky Baptiste gets knocked off his stride and Gurns slides in to push the ball to Tony Taggart. Taggs then curves in a quality cross that Andy hammers home with his shiny nut. “Ooh! Andy Gurney” comes the chant, the ‘ooh!’ collectively exhaled like an emphysemic man being punched in the sternum, possibly by Andy Gurney, as his hot-head reputation precedes him. As does his whole-hearted one though, and he was everywhere today, committed to every flank-laden ball that he had even a 10% chance of catching. With nine minutes to go, Jamie Slabber seals the game applying a featherbed forehead to a ball returning to earth after another Gurney header cannons up off the bar and thus we squeeze our way into the third qualifying round with the same ease as a tennis ball into a child’s sock. In that next round we have been drawn to host Fleet Town, of the Southern League Division One South & West. We will mostly likely go into that game without a manager. This morning, just prior to my publishing the above report (written yesterday), news came through that Ian Baird had tendered his resignation, and will take over at Eastleigh with immediate effect. I'm a bit too stunned to comment further at this juncture, except to say with regards local rivalries, I imagine we won't have any problems generating some heat with them Spitfires in the coming months.